Our next open day at the unit. 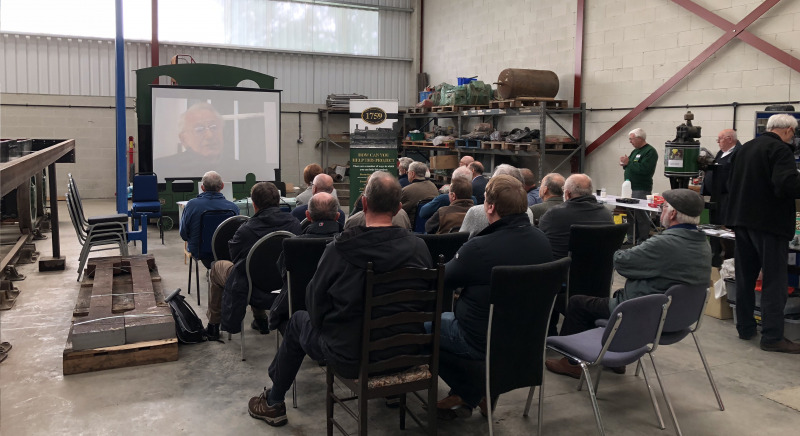 Saturday 6th October saw the 11th Annual General Meeting of the Class G5 Locomotive Company Ltd. We were joined by over 40 Shareholders and Friends. Roger Womersley, one of the founder member of the company, stepped down from the role of Treasurer, which he has held since the start of the company in 2007. We thank him for efforts, enthusiasm and more importantly keeping the books straight. Steve Raine, one of the directors, was elected to take his place. The AGM was followed by a fascinating film of Alan Tingate's reminiscences of his days as a fireman at Blaydon Shed. 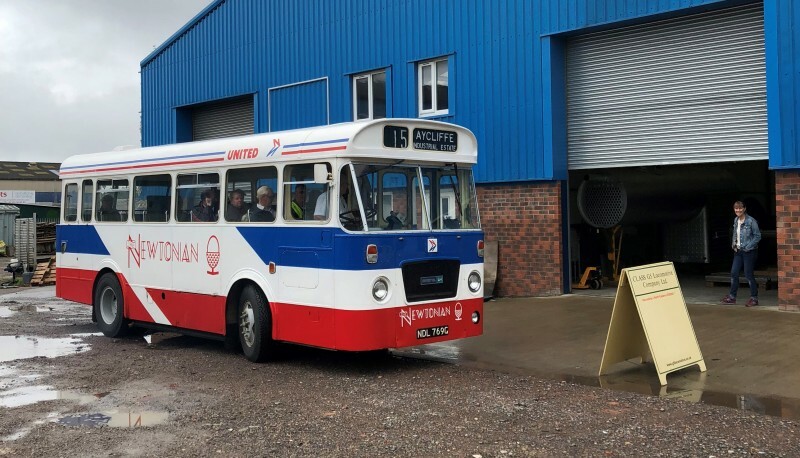 On Sunday 12th August Aycliffe & District Bus Preservation Society ran a number of return trips from the Locomotion Museum, Shildon, to our unit. Thanks to all who visited. Saturday 7th July saw the 3rd annual G5 Conference. 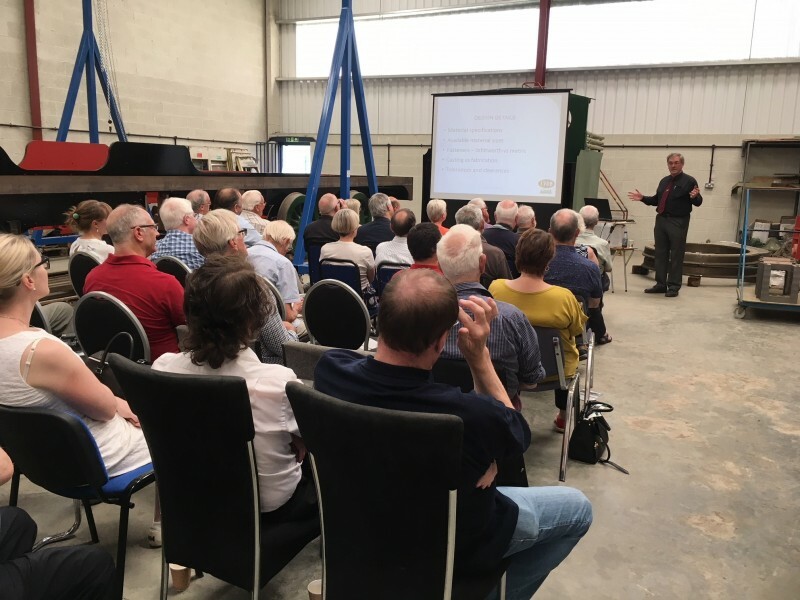 At 3pm we had about 40 Shareholders and Friends at the unit for a superb technical presentation for David Elliott, our design engineer, on the progress and difficulties of the build. We then moved onto the Mercure King's Hotel in Darlington for an evening meal and a fascinating presentation from David Dunn, who has access to and is archiving the JW Armstrong collection (he currently has nears 450,000 photographs). David's presentation was of G5s in steam and being scrapped. 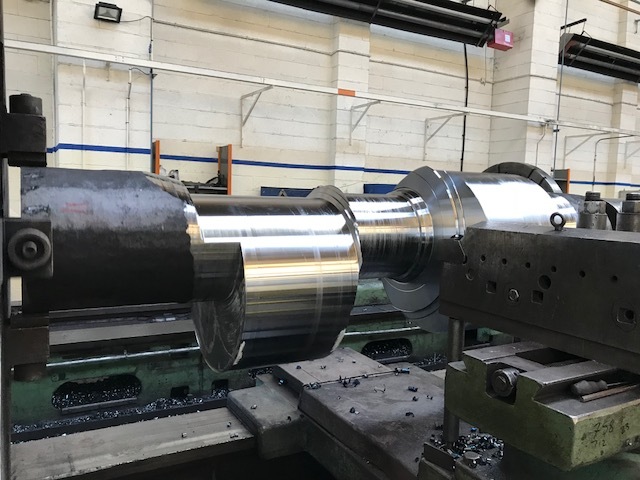 Lincoln Crankshaft have now completed the rough machining of the crankshaft. It will now have a slot cut out of between the webs to provide a test sample to comply with testing requirements. After this it will be ultrasonically tested for flaws in the forging and then the final machining will take place. Many thanks to all the friends who have visited our open days throughout the year. Have a look at the gallery to see the progress with the crank axle. 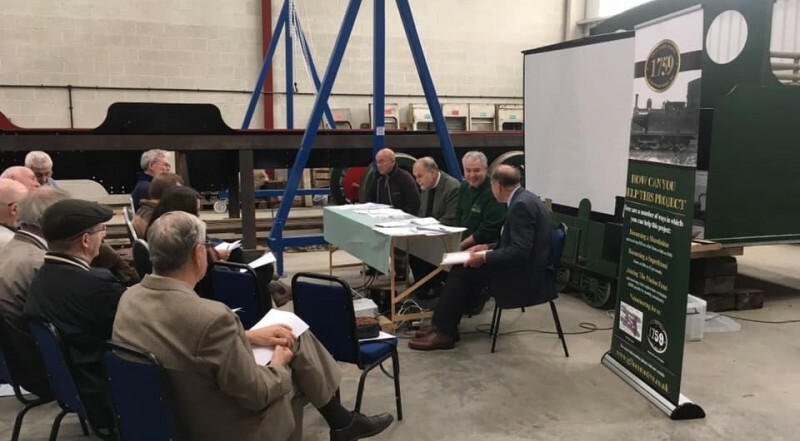 Following on from a meeting on 19th April 2017 , which was attended by representatives of G5LC, Project Design Engineer David Elliott, Ricardo Rail, Mott MacDonald and Lincoln Crankshafts & Machine, the order has been placed to forge the crank axle. This is a major step forward for the project as this is the last expensive component to be purchased, meaning the project is now around two-thirds complete. As crank axles are a safety critical item, this has taken around 12 months for all parties to be happy and clear about how the crank axle is to be produced. David Elliott, Project Design Engineer commented: “The ordering of the crank axle for the new G5 locomotive represents a major step forward in the design engineering work required to permit main line running. The study work undertaken by Mott MacDonald has demonstrated that the minor improvements made to the design of the original G5 crank axle, and using a modern chrome molybdenum forging steel will produce a crank axle which complies with the modern national railway standards for axle design. “This says a lot about the quality of the original design which dates from 1896! The G5 class in common with many locomotives designed in the late 19th and early 20th century has its cylinders mounted between the frames. This necessitates having a crank axle to transmit the drive from the connecting rods to the wheels. By the time that today’s design standards were written, steam had been withdrawn and no modern rail vehicles have crank axles. Whilst the original design is believed to have worked satisfactorily, we do not have any of the calculations or assumptions used by the draughtsman in 1896! This precludes the use of the 2nd method. We therefore need to undertake calculations and modelling to assess whether the existing crank axle design meets modern requirements. Given the complex combinations of forces that are experienced by crank axles, this would severely stretch the capacity of a piece of paper and a calculator! Mott MacDonald use ANSYS Finite Element Software to do the work. The ANSYS software produces a very convincing picture of the stress in every part of the axle so it is vitally important that we define the correct inputs! The stress levels can then be used to work out how often, as well as where, the axle needs to be checked that it hasn’t started cracking, since they are critical to the safety of the G5. In order to make this analysis as accurate as possible we need accurate figures for the weight of the components and as a starting point we have weighed the leading wheelset in order to accurately assess the weight of the crank axle wheelset. Have a look at the gallery to see pictures of this operation carried out by David Elliot. The Crank Axle Degree Fund was launched with a target of 360 pledges of £100.00 – thus providing us with enough funds to purchase the crank axle; so far, we are over 50% of the way there. November 5th went with a bang as usual and with it went out last open day of 2016; although don't forget that we can make special arrangements for shareholders to view the current stage of construction by contacting one of the team. We will be back next year in March to start a new programme of Open Days. We still have our limited edition O Gauge Ace trains G5 models for sale - just contact one of the team - they could make an exciting Christmas Present. The machining and fitting of the motion bracket to the main frames. November 7th was our last open day for 2015, we expect to restart the open days at the beginning of March following the same pattern so the first Saturday in March should be it. The front wheelset has not been returned yet although it is now complete, we are waiting for some machining to be completed on the two main driving wheels still a Borough foundry. When this is complete we have a contract for the collection of the front wheelset from South Devon and the two other driving wheels and wheel patterns from Boro Foundry. We expect all this to be back in the unit in Shildon some time in December 2015. The transport will be at the hauliers discretion in order to minimise costs. From the 1st of February the G5 will be moving to new premises. The new unit is opposite the previous one at RRNE in Shildon. 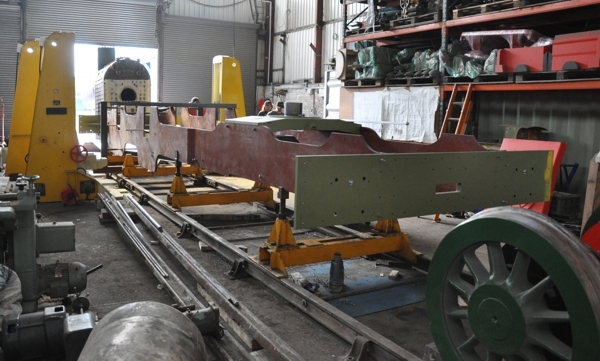 This is the last phase in the construction of the locomotive and will see the frames turned over ready to accommodate the bogie and wheel assemblies. The new unit has much more space and will allow us to work on the construction and store all the assembled parts safely. The cylinder blocks are now finally in position and the front buffer beam bolted into position. All the horn guides are now fully machined and bolted into position. The key ways have been machined in the leading driving wheels and we are awaiting transport to take the tyres and front wheels to Devon for assembly. Work is progressing with the fitting of the cylinders, the machining of the cylinder blocks is complete. The bolts need some final machining before the cylinder blocks and front horn blocks are fixed into position. The second hand right steam valve has been reconditioned and is now in full working order. The left hand steam valve which was bought new has been uprated with new stainless steel spindles to make them both the same specification. Following the increasing media attention, our May open day was our most successful open day since the boiler launch. From this open day we gained many new friends of the G5 and potential new investors visited Shildon to see the latest progress. The main frame - stretchers are fitted and all the horn-blocks with their wedges have been machined and fitted. The frames are now fully drilled and ready to accept all the necessary fittings. The buffer beams have been fitted and two pairs of ‘Group Standard’ buffers, along with draw-gear, are ready for use. Both cylinder blocks are now fully machined, ready for assembly into the frames. Cylinder end - caps are still awaiting machining. The boiler, with firebox is fully welded, and complete. It waits full hydraulic testing. The bogie assembly is completed and fully painted in NER livery. The four coupled-wheels are now cast and the tyres are stored, ready for fitting, once the wheels are fully machined. The main forged crank-axle has been designed and priced. The cab, rear bunker and rear water tank are assembled and in the process of being made ready for fitting to the frames. The ‘Westinghouse’ pump has been fully reconditioned, also painted in N. E. R. livery & is ready for use. Much of the brake-gear, including a full set of AWS equipment, air-brake control, air reservoir cylinder, traps and control valves have been purchased. Full restoration is in progress. A ‘Friends of the G5’ supporters group is starting to grow. Why not click the link and see. Saturday saw the sun shining at Rail Restorations North East for the launch of the newly completed G5 Boiler. The largest standard gauge steam engine boiler to be built in this country for the last 45 years. The team had a very successful 4 days at Barrow Hill on April 13,14,15 & 16. We hope you were able to come along and meet us for all the latest up to date information. We certainly enjoyed the Steam Gala and were very encouraged by the amount of interest shown and the financial support received. Many thanks to those of you who made it and keep watching out for more information - we hope to have regular open days soon at RRNEL so that you can come along and see the progress for yourself. Following the relocation of all the completed components to RRNEL at Shildon work has commenced at a pace on the construction. The main frames have been set up on stands and the buffer beam ends, crosspieces and castings aligned for assembly. Watch this space about news of the completion of the boiler. Picture by S. Fox, The frames are being assembled upside down to make access to the work space much easier.